Have you recovered from your Thanksgiving dinner? I haven't. I'm still in the mood for food...particularly orange food. Blame it on the twice-baked sweet potatoes with chipotle pecan streusel. The secret ingredient in that recipe was the chipotle chile powder, which my Walmart in the middle of nowhere had on the shelf, much to my delight. It's my new favorite spice, and I can't wait to add it to the soup below the next time I make it. Which just might be today. 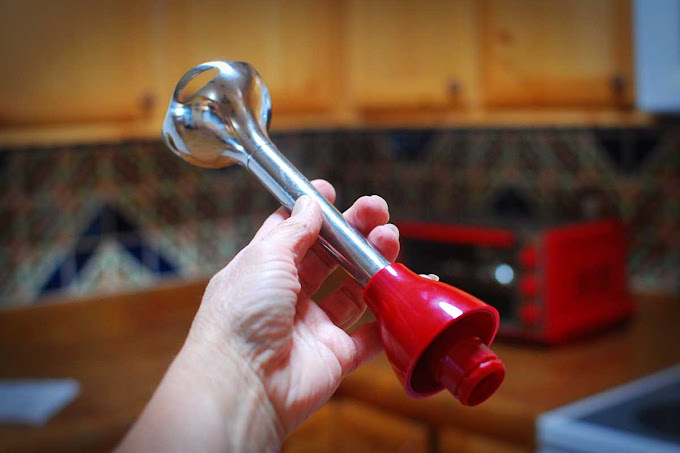 An immersion blender. I am normally not a gadget person, but this thing has become more of a necessity in my kitchen than a gadget. I may never use my regular blender again. Why disassemble, clean, and reassemble a blender when you can just eject the end of this thing and rinse it off? I haven't used it to blend margaritas, only because I never thought of it until just now, but I'll bet it would do the trick. It might even mash potatoes. Heck, you could probably stir paint with it if you washed it off real good. But getting back to the soup recipe... I learned a very important lesson last winter once I started making it, and I learned it the hard way. Grocery stores do not stock the main ingredient (canned pumpkin) year round. It is only available from about October through January. After that, you cannot find it on the shelves - at least in New Mexico, you can't. So if you do make this soup and fall in love with it (and I'm betting you will), start stocking up now. 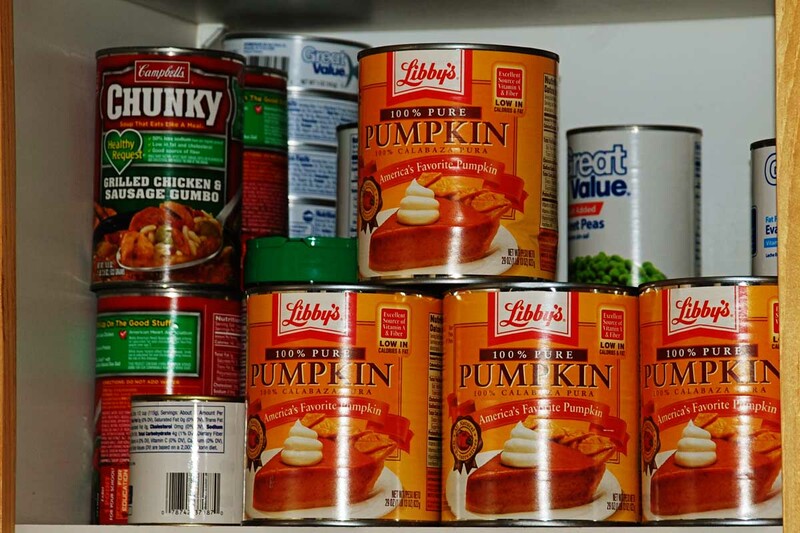 A girl can never have too much land or too much pumpkin in her pantry. And you can quote me on that. 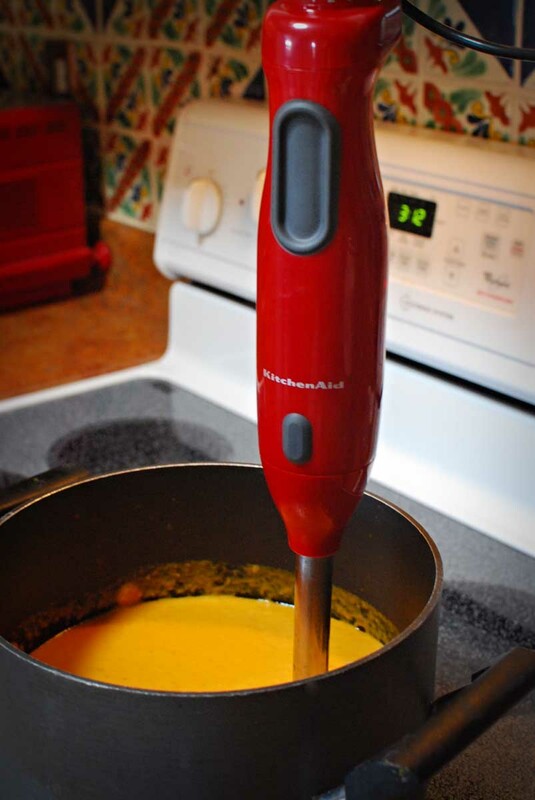 Love that hand blender. We have one that we have had forever and use it to make our milkshakes directly in a drinking glass. Good idea on the pumpkin hoarding! 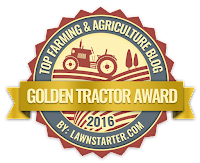 I think there was a time when you could find it year round but there have been shortages the past few years due to weather conditions. Ohhhhhh....that DOES look tasty! And, yes, I'm craving orange things, too, right now. Our daughter made Bobby Flay's chipolte sweet potatoes...oh, my! Yummy! Is Amelia still around? I had a Cooper's hawk on the transformer pole out back yesterday. Pumkin = *blech* here. Sorry, you can have it all. Although it's handy to have around when my dog gets constipated. I love pumpkin soup too. Soup is my staple during these long, hard winters here in Canada. A crock pot is a nice addition to a simple household. I cooked a whole cauliflower in water in the crock pot, drained the water, tacked on some Mexican chipotle cheese and into the micowave until the cheese melts. It's a hit a most potluck parties. You could make soup out of this cauliflower too. The soup does sound tasty, but most of all I've been wondering about the status of Amelia the pigeon. Is she still hanging out at 7MSN??? She'd be crazy to move on. Thanks for the tip. I will stock up on canned pumpkin next trip to the grocery store. The soup sounds delicious. Today's mission: I want pie, pumpkin, now. I've got the exact blender...colour and all! And...I love it! A friend moved to Portugal and electrical devices are different there due to voltage and current ...I inherited it when she left. Best little gadget I've ever owned by far! I use it all the time for blending my soups... which I make a lot in winter time. Just made her Kale and Potato soup the other day. Doing it the other way is darned dangerous with boiling hot soups! They shouldn't even be allowed to talk about pouring soup into a stand blender....I've heard soooo many stories about horrible burns. This.... is absolutely the only way to go... and it does such a great job. You can totally make it velvety...or leave some chunks for a more rustic texture.... I love it. I'm on my 3rd blender like that, I use it every day. I whirl together half a cup of nonfat cottage cheese with a small container of sugarless jello and make myself a wonderful low carb dessert. Here's the deal with pumpkins - I know because the farm I live on grows and sells bajillions of them. First, there are squash that taste more pumpkiny that actual pumpkins, and those will last all winter in your house. I gather a collection of them in the fall, use them for decorations in October and November and also for paperweights and doorstops. In December I wrap them and put them under the tree so they're Christmas decorations. I use a few for cooking along the way. I had a banana squash last year that I finally used in March. It was perfect. Of course the cans take up less space, but they aren't near as much fun. Oh, and if one happens to develop a bad spot, I throw it whole to the horses and goat. Your donks would love it. I love the Tasty Kitchen blog, always find the best recipes there. Sounds good will give it a try. Ive got a dusty immersion blender in the back of the drawer I havent used in years...Knew Id want it someday. See mom hording does have its uses! Yummy! I used a small dose of chipotle chili powder as part of the seasoning for the turkey rub. I happen to be a Kuner's fan--they make the best canned pumpkin, but you can only get it if you live in the Midwest. Hand blenders are indeed awesome little inventions! We use ours all the time.